The resources of Mount Sirung have not been inventorized since geological mapping in this volcano has not been done yet. From the appearance in the field found many springs in the north of Mount Sirung close to the Port of Baranusa. This hot springs is a manifestation of geothermal resources. Mount Sirung is the only active volcano located in the western part of P. Pantar. 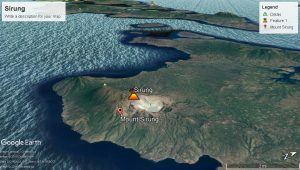 The center of volcanic activity of Mount Sirung is currently located inside the Sirung Caldera surrounded by volcanic cones like Mount Sirung (862 m asl), Mount Topaki (1318 dpl), Mount Anunggolak (794 m asl), Gunung Sombutang (748 m above sea level) ), and Mount Tomayang (742 m asl). 1852; Phreatic eruption from the main crater. 1899; Phreatic eruption from the main crater, eruption accompanied by a roar. 1927; Phreatic eruption from the main crater, crater lake water disappears or dries up. 1934; Phreatic eruption from the main crater, occurring on June 14 until mid-July. The eruption products are ash, Mud, and stone. 1947; Phreatic eruption from the main crater. 1953; Phreatic eruption from the main crater, occurred on July 24 at around 09:00 WITA. Smoke eruption reaches a height of about 500 m above the peak. Thick ash deposits in Kampung Kaka about 0.5 cm. Kampung Kaka is located north of lk. 4 km from the main crater. Eruptions also accompanied by felt earthquakes on the 24th, 25th and 26th of July. 1960; Phreatic eruptions occurred on March 13th at 6:00 pm until midnight, eruption center at Crater B. 1975; Phreatic eruption from the main crater. The eruption occurred on May 12th until June. Abu eruption settles northwest from the crater, the area affected by ash deposits as large as 1k. 25 km2. 1998; Phreatic eruption from Crater A. Eruption occurred on May 18th. Abu eruption settles northward for lk. 100 m from the crater lip (still inside the caldera). 2004; There was a small phreatic eruption from Kawah D on March 26 at 08.05 WITA. From the history of its activities, the nature of Mount Sirung eruptions are phreatic eruptions that produce ash, mud and rocks (volcanic bombs). The characters of each eruption are almost identical or unchanged. The rocks that make up the Gunungapi Sirung Complex are generally dominated by lava flows which are then exposed by large eruptions that produce pyroclastic deposits and are terminated by phreatic eruptions resulting in phreatic deposits. This lava product spread to more than 5 km so that the slope looks like a shield. The eastern part of the slope which has a slightly sloping shape such as a shield is formed by the dominance of the watery basaltic lava flow that repeats over and over again. The western slopes have many cone-shrouded volcanoes like Delaaki Peak (938 m asl), Taupekki Peak (1344 m asl), Boyali Peak (1080 m asl), and Mauta Peak (1023 m above sea level). These cones are built by lava and pyroclastic products.